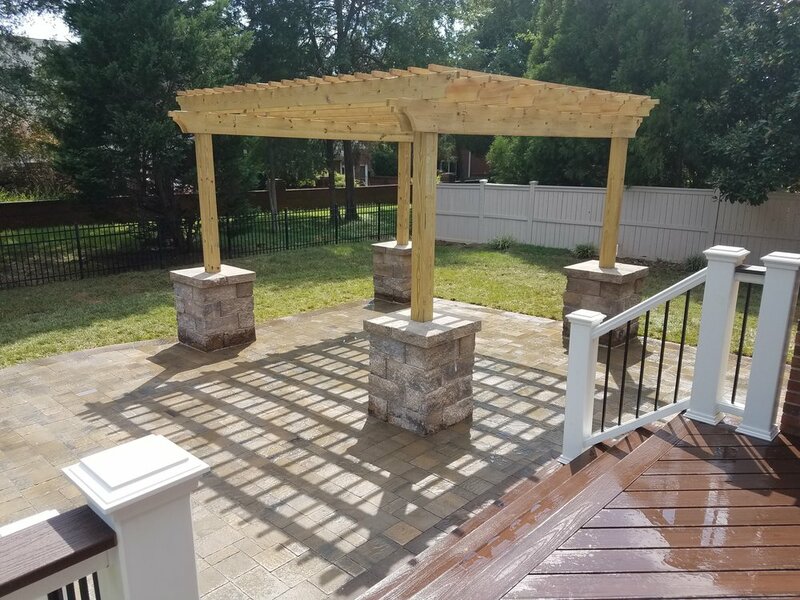 Deckscapes designed and built this project for our client in south Charlotte earlier this year. The reason I liked this project so much was the transition from what the backyard looked like to the finished project. The yard was in complete disarrayIt had an old deck and pergola that was barely standing. I wish I had the 'before' picture to show you. We started by removing the old deck, large pergola, faulty wiring, crumbling fire pit and numerous bushes and trees. Then we built a small but functional Trex deck using Trex Transcends Spiced Rum decking with hidden fasteners and a Trex Transcends railing in White with black aluminum ballusters. Next we built the large pergola using Pressure Treated Pine. The beams and rafters have a scrolled cut on the ends for an attractive look. We wired the pergola for a future ceiling fan and a switch on the 6x6 column. After the pergola was constructed, we graded the yard and readied the area for the pavers. 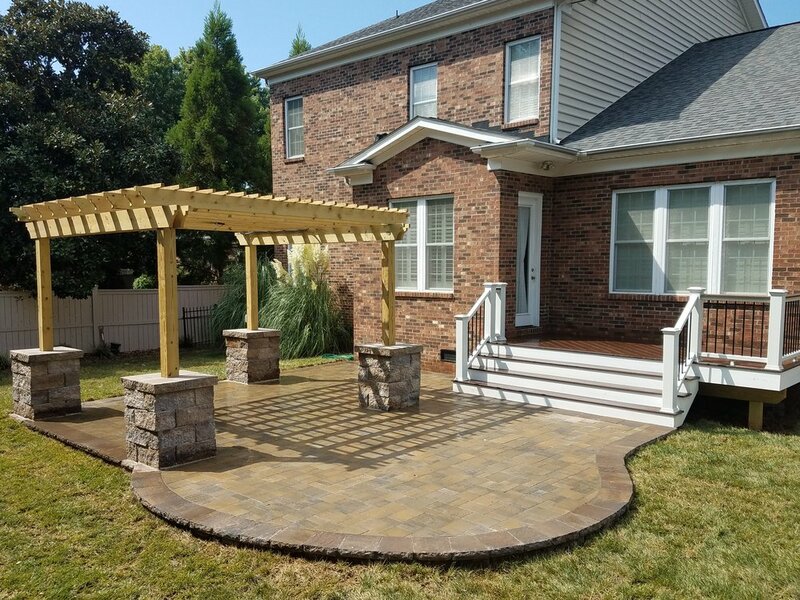 We installed approximately 460 square feet of Belgard Urbana tumbled pavers along with a matching border and step down to the yard. Then we installed the Belgard stone about a third of the way up the 6x6 posts to finish off the look. Lastly we installed new sod around the new site to really give the project that finished look. I loved the way it turned out and I know our clients loved it too. This yard transition by Deckscapes will really help them to Enjoy Being Outside.